Have any of your 2012 resolutions for the Chinese Year of the Dragon flourished or fallen yet? My goal to draw more birthstone dragons is taking off slowly - but I hope to put pencil to paper this weekend. I promise I didn't fix the results, but the poll votes on my Squidoo fantasy art lens are in favor of me drawing Amethyst, my own birthstone, next! Before I become entranced searching for dazzling purple gem reference photographs, I decided to warm my eyes up on handmade jewelry. Perhaps these unique Chinese dragon necklaces will bring their wearers luck in the new year. Good luck drawing amethyst! I look forward to seeing that. Great picks for Chinese New Year. 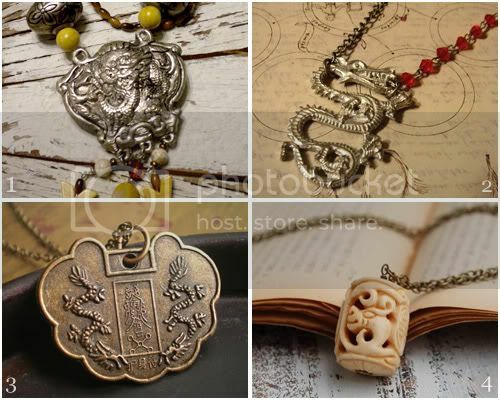 I especially like the carved dragon charm necklace. link up your Friday Feature! I haven't fallen off the wagon yet - but geesh, it's only January 6. Ask me again next Friday!